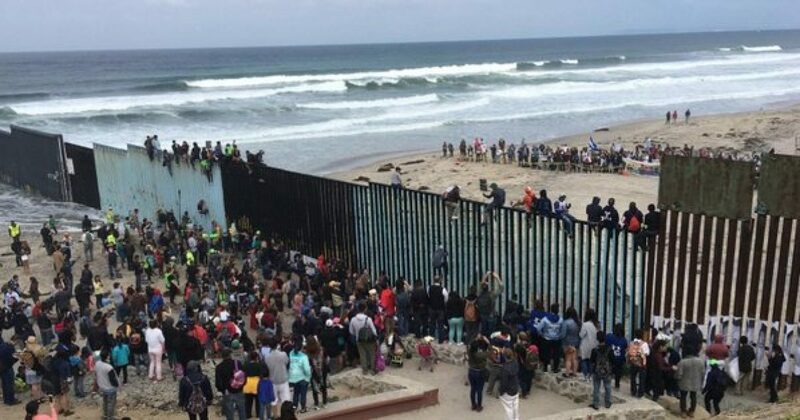 There is credible evidence in statements from caravan members that a mass “human stampede” across the US border is being planned by leaders of the caravan of Central Americans, believing that some will be apprehended, however, due to limited US security resources on the border, the vast majority will escape into the country. Tijuana Mayor Manuel Gastelum compared the aggressive and ungrateful army of Central Americans to the 3,000 Haitians who failed in their attempt to enter the United States last year, ultimately settling in Tijuana. Posting on the Tijuana Facebook Page, Mayor Gastelum declared, “The Haitians arrived with their papers, with a clear vision, in an orderly way, they never asked us for food or shelter,” renting apartments and making their own food. He said the Haitians found jobs and “inserted themselves in the city’s economy” and had not been involved in any disturbances. In the last video, a Mexican journalist captures video of a caravan leader alleging that the caravan is receiving assistance from Russia. These so-called migrants are not asylum-worthy. They are not escaping violence or oppression. Their home countries are being ruled by lawless thugs and criminals, and they don’t have the guts to fight to take back their own countries, so they are determined to illegally invade America, whose citizens have built a free and prosperous society, regularly paying for that freedom and prosperity with the blood of their young sons and daughters, who have fought to preserve that freedom and prosperity. I, for one, do not take lightly giving that hard-earned freedom and prosperity away to strangers who arrogantly march to our borders, proudly waving the flag of their home country, with the intention of invading my country illegally. They have no respect whatsoever for American law or the American people. Following is a 25-minute video of a Mexican independent journalist who looks like a gringo (his mother is Swedish). He reports that Mexican television network Televiso interviewed a caravan leader who arrogantly demands that on behalf of the caravan, he wants to negotiate a deal with President Trump, otherwise, they are rushing across the border illegally. He also speaks of the prejudice of Mexicans against him because he does not look like a Mexican national, but rather, a gringo foreigner.